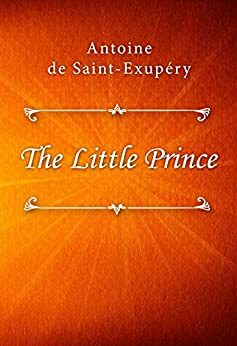 The Little Prince - Kindle edition by Antoine de Saint-Exupéry. Literature & Fiction Kindle eBooks @ Amazon.com. Young Osment (The Sixth Sense; Pay It Forward) again proves his mettle as an actor, giving voice to the Little Prince in this crisp, full-cast production of the literary classic. He approaches the role with a gentleness and sensitivity that touches the heart and never sounds maudlin. As the pilot whose plane has crashed in the Sahara, Gere plays it low-key, creating a perfect partner for Osment's interplanetary-traveling, wise-beyond-his-years prince. Gere expresses just the right mix of amusement and bewilderment as the prince interrupts the pilot's efforts to repair his plane with a request that he draw a sheep. The adept performances capture the timeless nature of Saint-Exupry's fable about how a child sees the important things in life much more clearly than many adults do. All ages. (Dec.) birth. If you have a Cuffe translation of The Little Prince it too is very rare and likely will never be re-printed. The Wakeman edition is becoming such too, sadly. The reason for this is that the Little Prince fell out of copyright in England after fifty years, so Penguin and Pavillion, actually anticipating this, did the Cuffe version and the Wakeman version respectively. What they didn’t anticipate was that later in 1995 the UK harmonized its copyright law with the EU where copyright is 70 years and St. Exupery is allowed an additional 30 years due to his premature death in exceptional service to his nation, and The Little Prince, like a handful of other titles, fell back into copyright there. Hence The Little Prince will not now fall out of copyright in Europe or England until 2045. This means, alas, likely no Folio Society edition or any other UK or European one for quite some time. In the U.S. of course, they ignore all this, and do their own thing, hence the Howard translation in 2000. Additionally, as I understand it, there are some differences among the family. 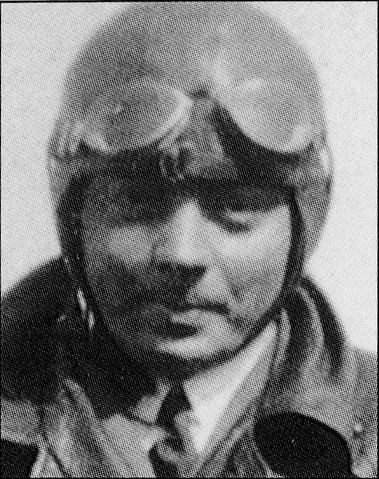 St. Exupery’s birth family appears to have approved of the Wakeman translation, but St. Exupery’s wife Consuelo (and now her family), I believe, own the copyright, and my guess is, have a pretty strict and exclusive agreement with Harcourt Brace in North America. Why would HB not, for this incredible money-maker that most publishers would love a piece of. Which means yes, the Katherine Woods version is still available in England where it is beyond HB’s taste and control, thankfully. 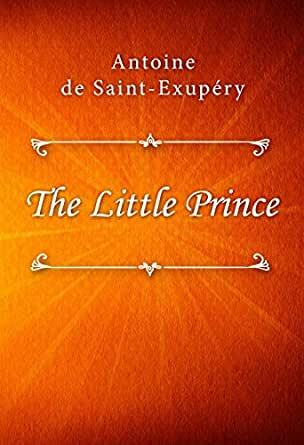 The review is only for the quality of book ''The Little Prince: The Childrens Classic Novella (Voted Best Book of the 20th Century in France) by CreateSpace publishing. I was attracted towards this version because it said it's Katherine Wood's translation which is better than Howard's translation (Blue Cover). Also, the cover looked exactly same as the one I loved as a child. So I bought this to gift a friend and when it arrived it was nothing like I expected. It said non-illustrated in the description, but I was not expecting it missing even the illustrations mentioned in the text. 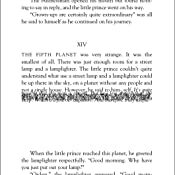 It's not like a proper book at all, it's just like the text of Little Prince type-setted and printed on some home printer. It looks more like home printed and less like a book. I have not confirmed if it actually is Wood's translation if it is, it does have some value for those who are looking specifically for this translation, kind of like a manuscript. If it's not Wood's translation, it's a scam. This version is useless for first-time readers and for gifting. Attached to this review will be a silent flip-through of the entire coloring book so you can make an informed decision as to whether or not it will work for you. 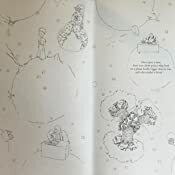 This is a wonderful coloring book for fans of “The Little Prince”. The artwork is derived from the original artwork in the book but has been put together in a way to make it more fun to color. Additionally, there are also excerpts on each page from the English translation of the story. It gives you a feel for what the book is about but it is not a re-telling of the whole story. The line work on the designs is very delicate. Some designs are open and easy to color while others have many intricate and small details. I went back and re-acquainted myself with the with the original story (though the English translation!) What I didn't realize as a child was how adult the many themes of this book were. What I remember from reading it as a child was thinking both how wonderful and how sad it would be to be the little prince. The designs are printed on both sides of non-perforated paper. Most of the designs spread across two pages. Most of the pages in my book did not line up well, so the two-page spreads were off. Most designs merge into the binding and and part of the design appear lost in it. The binding is sewn although the cover and the very edge of the bound book seem to be glued together. 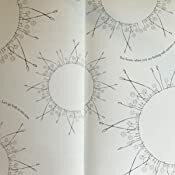 I think it is a matter of cutting threads to remove pages – though it appears that if you cut threads, the entire book will come apart as it is sewn from front to back with multiple threads. I could get the book to lay fairly flat by “breaking” the spine with a hard crease. That exposed the parts of the design that were missing at the bound edge but it will make it easier to color into the inside portions. All markers and gel pens either bleed through or leave a noticeable color shadow on the reverse side of the page. My coloring pencils (soft core and hard) worked well on the paper. For me, the book will have to be for coloring pencils only. Taking the book apart is problematic as I'll never get the images to line up and it appears that small amounts of the design are missing from where the two-page spread designs come together. 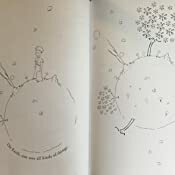 While I love the illustrations, the publishing issues (two-pages spreads, missing design work, mis-aligned pages, etc.) as well as the inability to use anything other than coloring pencils cause me to detract a star from my rating. If I were reviewing only the artwork, this book would be fantastic; however, it is a book I intend to color in and the other issues present problems that may well keep others from contemplating buying this coloring book.